Use WAVE to display the uncalibrated signals. Find a calibration pulse (or a segment with known amplitudes). Mark samples of the low and high amplitude phases using the `<' and `>' markers respectively. Figure 5.1: Signal calibration using WAVE . Signal 3 (ABP) has been selected (note that all of the other signal numbers have been removed from the Signal list). The `<' and `>' markers bracket a step in the recorded calibration pulse near the center of the signal window. In the Analyze window, we have clicked on Calibrate , and the result of doing so appears in the Analysis Commands window. Set the Signal list field in the Analyze window to match the signal(s) you have marked. You can calibrate more than one signal at a time if suitable calibration pulses for each signal are present between the `<' and `>' markers. Be sure to remove any other signals from the Signal list. Click left on in the Analyze window, and answer any questions that appear in the Analysis Commands window. These questions will always appear if the header file for the record does not contain signal descriptions or physical unit specifications; some or all of the questions may not appear if the signal type and calibration pulse type are already known. Repeat the previous steps for any other signals that require calibration. Figure 5.1 illustrates signal calibration using a record from the MIMIC Database. In this case, the type of signal (ABP) is known from an entry in the WFDBCAL file (not shown here), so that calsig is able to determine the physical units of the signal (mmHg). Since a variety of calibration pulses are used for ABP signals, the WFDBCAL file does not specify the pulse levels, which calsig has asked us to enter (in this case, we have entered 60 and 120). Based on this information, calsig determines the offset and gain needed to convert raw sample values for signal 3 into ABP measurements in mmHg. calsig then makes the appropriate changes to the header file for the current record. When WAVE or another WFDB application next opens this record, the ABP signal will be properly calibrated. 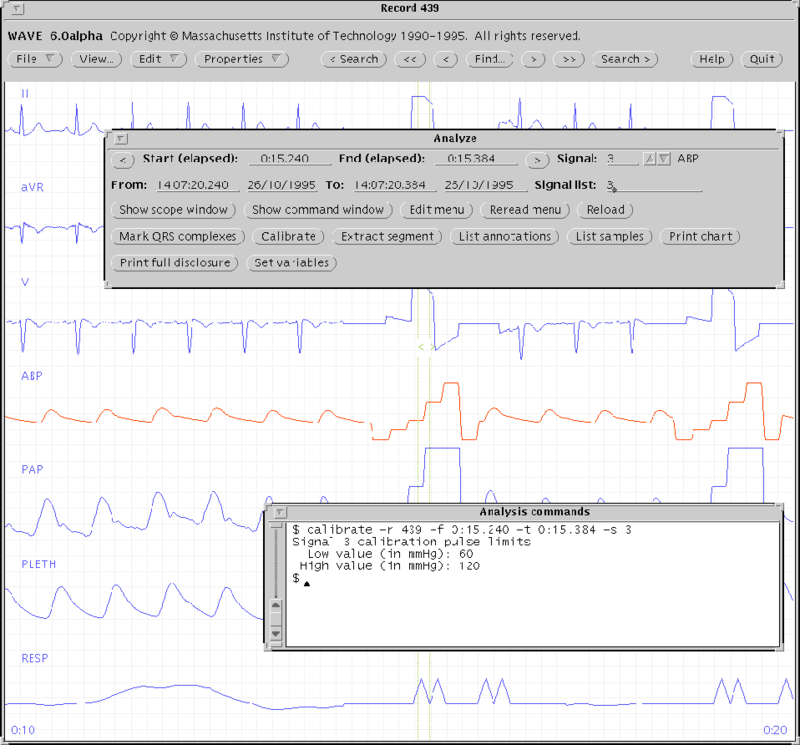 By default, calsig generates an amplitude histogram of the samples between the `<' and `>' markers. It then identifies the low and high amplitude portions of the calibration pulse by searching for the two largest distinct modes in this amplitude histogram. For this reason, calsig works best if the segment bounded by the `<' and `>' markers includes at least a few samples of both the high and low amplitude phases. Avoid placing either marker immediately next to the transition point between the phases if possible. If calsig fails to find two distinct peaks in the amplitude histogram, it will produce an error message; if this happens, adjust the positions of the markers and try again. For further information on signal calibration, see calsig(1), in the WFDB Applications Guide.